Is posible configure Fx4.0b7 to make accesible the website webpage by righ clicking them in the addons list and not inside of each addons more info? I have terrible trouble with the terminology of add-ons. 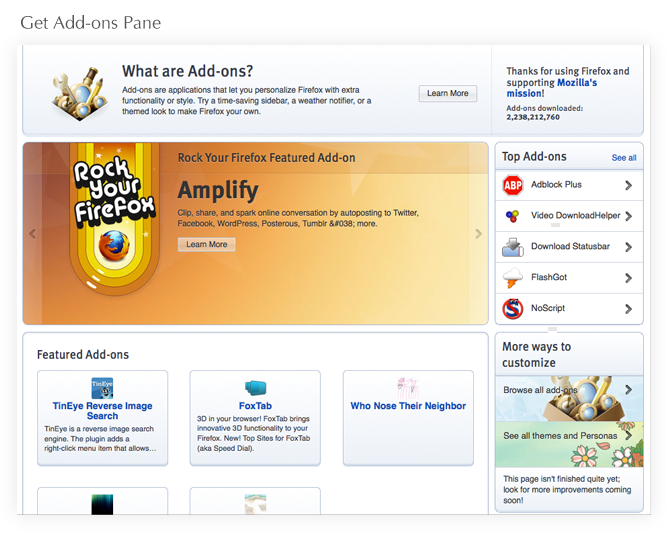 According to the UI, “add-ons” include both “extensions” and “plug-ins”. But everyone seems to say “add-ons” when they really mean “extensions”. Automatic update doesn’t address any of this situations. The review system doesn’t address any of this situations. Disabling automatic update individually requires a cumbersome process that demands too much clicking and is undiscoverable. Even the “disable automatic update for all add-ons” is difficult to discover. The add-on page says “automatic update default” but don’t say which value is the default. I would advise to remove the “default” button because it doesn’t provide any useful information and is confusing. The place for each add-on occupies at least 3 times more space while offering less information than the previous design. About the only thing that I like about the new design is that the it’s now a tab and not a window. The general problem with the new design is space wasting. Too much white is used that could be used to provide useful information. I also dislike the use of scrolling bars in this type of interface. I hope that you pay attention to my comment despite is overall negative tone. My intention is a better interface and system in the future and not put you and any of the other developers down. Can I translate this blog post into French for publication on my own blog (with your screenshots)? http://www.tokkoro.com est un site d’emploi « nouvelle génération » généraliste multi-langue intégrant toutes les fonctionnalités des réseaux sociaux pour mieux rapprocher candidats et recruteurs. Le site est intuitif et facile à utiliser. Son objectif : créer une nouvelle expérience en matière de recherche d’emploi ! Rédigez, imprimez et publiez autant de CV que vous le souhaitez sur tokkoro. L’assistant de création de CV vous aide à structurer votre CV et à le mettre en forme pour un résultat professionnel. Recherchez de manière efficace les offres d’emploi qui vous correspondent, gérez vos candidatures et annotez-les. Remplissez votre profil et partagez les opportunités professionnelles au sein de votre réseau. Pour une recherche d’emploi sans discrimination ou pour rester discret dans votre recherche, utilisez les préférences de confidentialité sur votre profil et sur chacun de vos CV. tokkoro.com dispose également d’un référentiel des métiers pour améliorer l’adéquation entre les besoins des entreprises et les aspirations et compétences des candidats. i love, love the new designe!!!!!! These are all huge improvements, excellent work! Hope FF4 is released as soon as possible. when a new version of Firefox is released-before I download and install it, you should tell me which, if any, of my addins will not work. I have had the experience of installing the update and being told a favorite addin will not work. Give me the choice of a more secure browser or an existing browser that is fine tuned to my needs. I don’t like the almost completely mouse-driven functionality (I can’t hit ‘X’ on my keyboard to go to Xmarks). 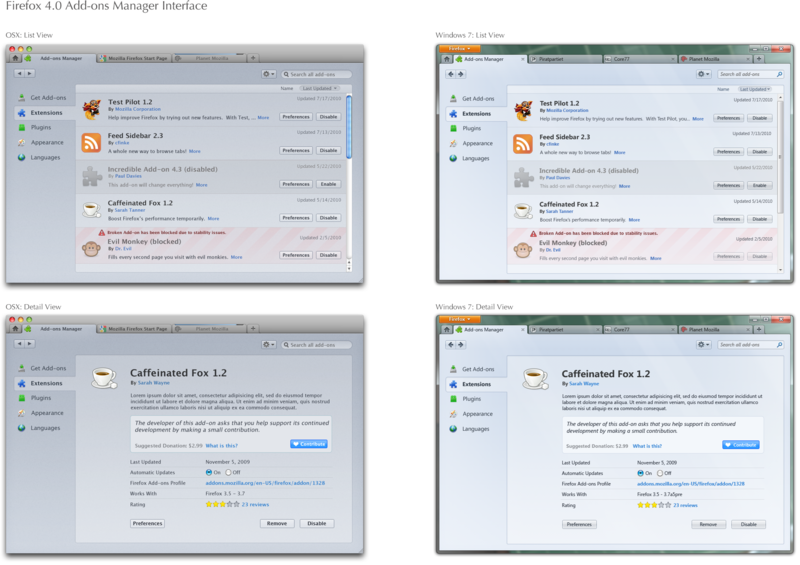 I realize this may not be a UI issue, but the new add-ons manager is slower. Search is nice though.